The passenger compartment of the V-Class remained stable in the frontal impact. Protection of the passenger was good in for all body areas. Dummy readings showed good protection of the knees and femurs of both the driver and passenger. Mercedes-Benz showed that a similar level of protection would be provided to occupants of different sizes and to those sat in different positions. The V-Class scored maximum points in the side barrier test, with good protection of all body areas. However, in the more severe side pole impact, dummy readings of rib deflection indicated marginal protection of the chest. A geometric assessment of the front and rear seats indicated good protection against whiplash in the event of a rear-end collision. 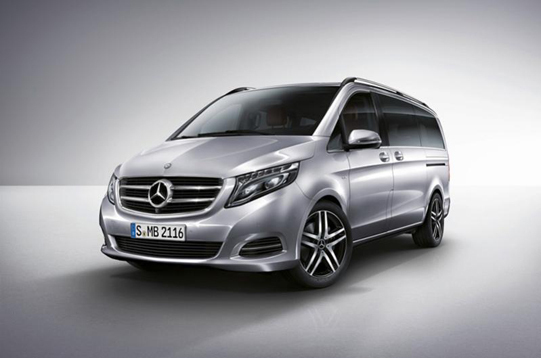 The V-Class scored maximum points for its protection of both the 1½ and 3 year dummies in the dynamic tests. Forward movement of the 3 year dummy, sat in a forward-facing restraint, was not excessive. In the side impact, both dummies were properly contained within the protective shells of their restraints, minimising the likelihood of head contact with parts of the vehicle interior. The child restraints were properly labelled with all relevant safety information. The passenger airbag is automatically disabled when a rearward-facing child restraint is placed on the passenger seat. The system is different from previous Mercedes-Benz systems which only worked with specific seats. As the system is not standard equipment, it was not assessed for this rating. Owing to the height and geometry of the front of the V-Class, no tests were performed against the front edge of the bonnet. The protection provided against head injury on the bonnet surface was mostly in the range from marginal to good, with poor results recorded on the stiff windscreen pillars. The bumper scored maximum points in Euro NCAP's tests, offering good protection to pedestrians' legs. The V-Class has electronic stability control as standard equipment and the system met Euro NCAP's test requirements. A seatbelt reminder is standard for the driver and, for the passenger seat, is expected to be on most cars sold so the system was assessed and rewarded. A driver-set speed limitation device is available as an option. As the great majority of vehicles will be equipped with the system, it was assessed and met Euro NCAP's requirements for speed-limiters of this type.